(MUSICWORKS) – Patients recorded lower anxiety levels if they had listened to music while in surgery. Playing recorded music to patients that are undergoing surgery reduces their stress levels and could even aid their recovery, according to a study by surgeons. Patients who were awake for surgery under local anaesthetic were played easy listening tracks, chart hits or the radio for a study by a surgery team at John Radcliffe Hospital in Oxford. The study was published in the Annals of the Royal College of Surgeons. Once the surgery had been completed and the patients were recovering, they were asked to rate how anxious they had felt during the operation. The patients that had had music played to them scored about a third less on anxiety levels and had a more relaxed breathing pattern during surgery. Hazim Sadideen, a plastic surgical registrar who led the study, said more work was now needed to establish whether playing music in operating theatres should become standard practice. “There are good medical reasons – calmer patients may cope better with pain and recover quicker.” Music might also lead to a happier, calmer surgeons and theatre staff, the researchers suggest. Stayin’ Alive by the Bee Gees or Another One Bites the Dust by Queen? 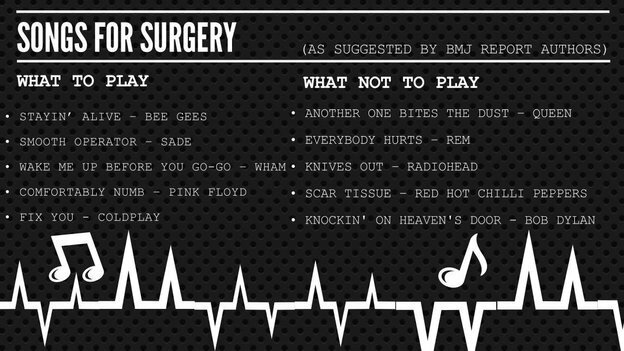 Cardiff surgeons have been looking at which songs work best for operations. After a study of music and healing, Cardiff’s University Hospital of Wales came up with a tongue-in-cheek list of what to play in theatre. While classical music is preferred by most surgeons, some more current suggestions were put forward. Sade’s Smooth Operator was approved – but REM’s Everybody Hurts is a no-no.